The King’s Speech was one of the most acclaimed and indeed popular motion pictures of 2010. It is a historical drama and it portrays the relationship between King George VI of Britain (1895-1952) and an Australian speech therapist Lionel Logue (1880-1953). It shows how Logue helped the king to overcome a stammer and how this enabled him to lead his country during World War II. The movie was made for 8 million dollars and it earned over 400 million dollars around the globe and was a world-wide smash hit. The movie was directed by Tom Hooper and written by David Seidler. Critics have widely praised the editing, cinematography, directing and acting and the movie was able to express the inner life of the main characters by the clever use of lighting and other cinematic techniques. The King’s Speech was produced by a British company and it was shot mainly in London. It had a cast of mostly British and Australian actors. King George VI is played by Colm Firth and Lionel Logue is portrayed by Geoffrey Rush. Among the supporting cast was Helen Bonham-Carter who played Queen Elizabeth, the wife of the king. It was nominated for 12 academy awards and it won four awards, including one for Best Picture. Seidler just before filming began, found the journal of Logue from the period and elements from this were incorporated into the movie. However, despite this the historical accuracy of the movie has been questioned and even widely criticized. The events take place mainly in the 1930s at a critical juncture for Britain and its Empire. The nation and its various dependencies had still not recovered from the ravages of World War or the Great Depression. Internationally, Hitler was in power in Germany and many feared, correctly, that there would be another World War . The rather bleak mood of the time is captured very well by the director. At this critical point in its history the British Royal Family faced its own crisis. After the death of George V, he was succeeded by his eldest son, who became Edward VII in 1936, but he wanted to marry a divorced American Wallis Simpson. This was unacceptable to many in Britain at this time as the King was also head of, the Church of England. Divorce at the time was socially unacceptable and the idea of the monarch marrying a divorced woman was denounced by the Anglican Bishops and others. When Edward VII did decide to marry Wallis Simpson, he was forced to abdicate, soon after his Coronation. This meant that his younger brother George or Bertie as he was known became king . This was all shown in the motion picture and is shown accurately. However, there are some inaccuracies in the movie. One of the most glaring and one that caused controversy were the scenes where Sir Winston Churchill, the future leader of war-time Britain, supporting the accession of George V, but this was not the case. In fact, Churchill, believed that Edward VII (1894-1972) should remain as king despite his marriage to Wallis Simpson. He was actually very friendly with the abdicated king and remained a supporter . 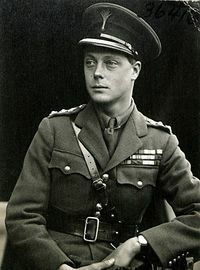 Unlike in the movie, Churchill did have grave doubts about the ability of George VI to carry out his Royal duties and this was shared by many others in the highest circles. Over time, he did come to accept George and even came to respect him as an able monarch and leader . 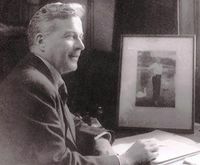 The central theme of the movie is the difficulties faced by George VI because of his stutter and how Logue was able to help him overcome his speech defect. This is historically accurate, and the future George VI had a serious speech impediment. In the movie the character played by Firth is shown as having a terrible stammer and that when he became nervous or anxious he was almost unable to communicate. This made public speaking near impossible for the monarch. The movie makes clear that his speech impediment was a result of his insecurity and shyness . This was very much the case and George VI did have a very bad stutter from childhood. The King’s Speech does show accurately the real problems caused for the future George VI and the entire Royal Family. In one scene at the opening of a exhibition celebrating the British Empire George is shown struggling with a speech and becoming visibly upset. The movie shows many senor officials and members of the Royal Family becoming gravely concerned about this. In the 1930a, when the movie is set, for the first-time members of Royalty were expected to speak in public and to be effective communicators because of the growing importance of the mass media . 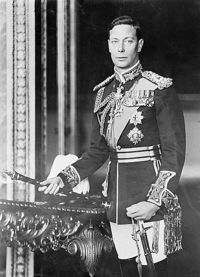 The inability of George VI to publicly speak clearly was a real problem and it was feared that it could damage the Royal Family and even undermine confidence in the government of the British Empire. The movie does somewhat exaggerate the importance of the king’s stutter, but it was nonetheless a very important issue for the Royal Family. Perhaps the biggest inaccuracy in the movie is that Logue was in reality able to help the King to overcome his stammer before the abdication crisis and his coronation rather than after these events. His first began to treat the second son of George V in the 1920s and continued to do so for many years. The movie shows that the treatment took place in the 1930s and this was no-doubt done for dramatic effect but this is not strictly correct. Cooper’s movie relates how George had been seeking help all his life for his stammer and he tried every technique and treatment that was available for the time, which is true. The 2010 motion picture does really capture the sense of desperation and anxiety that the future George VI had over his speech impediment. He is shown as going in desperation to the Australian Logue and this is also correct. The therapist is shown as using innovative techniques to help George to overcome his stammer and this is right. The Australian was an early pioneer in speech and language therapy and he was an innovator . The film shows Rush trying to instil more confidence in the Royal. He adopts a number of strategies, but none are shown to work. Eventually he provokes the king and in his anger he is able to speak stutter-free. In reality the speech and language therapist gave the monarch a series of daily vocal exercises, such as tongue twisters, that were designed to help him to relax. This helped the future king to relax and this was key to the improvements in his speech. The motion picture does show that the treatment was not a total success and the king continued to have a very slight stammer. This was indeed the case, however, the improvement in the speech of George VI was remarkable and this is accurately shown in the 2010 movie. It shows George having grave doubts about Logue and his treatment when he hears that he is not formally qualified as a therapist. In real-life, this did not cause a crisis in the relationship between the British sovereign and the Australian therapist. It is correct that Logue was not formally qualified that was because there was no system of education for language therapy when he was young. Instead he was self-taught and had travelled the world studying the ideas of respected speech therapists. The movie leaves the viewers in no doubt that the king and the Royal Family owed the Australian a great debt and this was the case and when George VI died, his widow, the Queen, wrote to the therapist to thank him for all he had done for her husband . The movie shows that over time that the two men began to become real friends, despite their differences. This was the case and it appears that both men liked each other and even enjoyed each other’s company. The relationship between the British king and the Australian is very realistically shown and indeed they remained friends until the early death of George VI. The movie shows that Logue was present when George made important Radio broadcasts to the British Public. This was into the case, but for many years Logue continued to coach the king so that he could speak in public. In the movie Logue is shown as present when George VI pronounced that Britain was at war with Germany in September 1939 during a radio address to the nation. This is not correct, but the Australian did provide the king with notes, on things where he should pause and breathe, and these were a real help in what was the most important speech the monarch ever made. Logue continued to coach the king for many years until about 1944. Logue is shown as being very much at ease in the presence of the King and treating him like any other client. This was not the case, despite their genuine friendship, Logue would have been expected to have been somewhat formal and respect the Royal Person of the King at all times. In real life Logue was not as easy-going and familiar with George VI as portrayed in the historical drama . Colin Firth’s performance was widely praised. The British actor won the Academy Award for Best Actor. While the performance of Firth was widely acclaimed there was some concerns about how accurately he portrayed the monarch. In the main Firth did manage to capture George VI and his character in the feature film. The British actor did correctly show that the monarch was a very shy and insecure man who felt that he was not equal to his Royal duties and this was something that greatly distressed him . His stammer may have been a result of his sense of inadequacy, but this cannot be known, for certain. Firth does show that the monarch did grow in stature after he was crowned as King. It leaves the viewer in no doubt that by the end of movie that Firth, who has largely overcome his stammer was able to lead his country in its hour of greatest danger . This was the case and the monarch became widely respected during the war with Hitler’s Germany for his leadership and his calm dignity. However, the script tends to be overly sympathetic to George and avoided the rather unpleasant aspects of his character such as his fits of anger and alleged acts of domestic violence. The performance of Helena Bonham Carter was praised, and she does capture the personality of Queen Elizabeth (1900-2002). She was a very supportive wife and dedicated to her husband and she did not want him to become king because she feared what it would do to him and to her family as shown in the feature film<ref. Rhodes, p 201</ref>. Geoffrey Rush played the character of the speech and language therapist Logue and he presented him as a larger-than-life figure who was charismatic and this was indeed the case. It is generally agreed that Rush really captured the personality of the acclaimed speech and language therapist.